So happy its the weekend - but as always it will go so fast! I enjoy my time to be able to craft and the weekend is a good time for me to do DT projects, challenges, or just be crafty in general!! I wanted to share with you my project for the next Lawnscaping Challenge - Try a New Technique. For my technique - I've always wanted to try stamping with bleach. I've seen so many cool projects done with it, and how it gives such a neat look. To tell you the truth I actually did another card previous to making this one - but I felt this one turned out a bit better overall. I first made a "bleach pad" by layering up a piece of paper towel and saturated it with bleach. 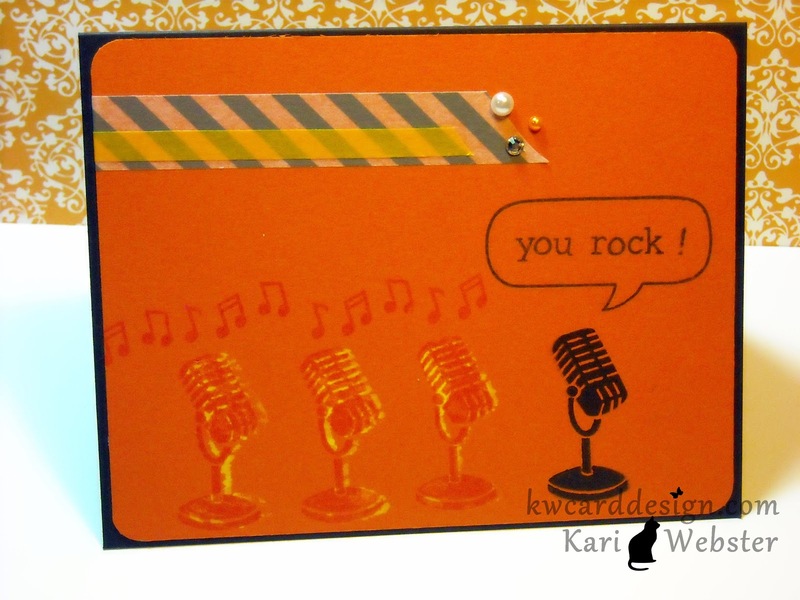 I chose the microphone from Stay Tuned from Lawn Fawn and stamped it out first with the bleach. The image wasn't as solid as I would have liked - but still gave it a neat look. I, then stamped the image again with Memento Morocco Ink and offset the stamped image a bit. Then, I stamped my microphone image with black Staz On ink. I took one of the speech bubbles from A Birdie Told Me, and stamped that above the black microphone. Above the others, I stamped in the Morocco Ink the music notes from Stay Tuned. My sentiment also comes from Stay Tuned. I wanted to add some texture so I turned to my basket of washi tape - and found this gray diagonal pattern and a thin mustard yellow pattern. For some embellishments- I added some gems and pearls. I forgot to say in the beginning - I finally was able to purchase the sampler pack of the Bazzill Card Shoppe cardstock, and I love it!! 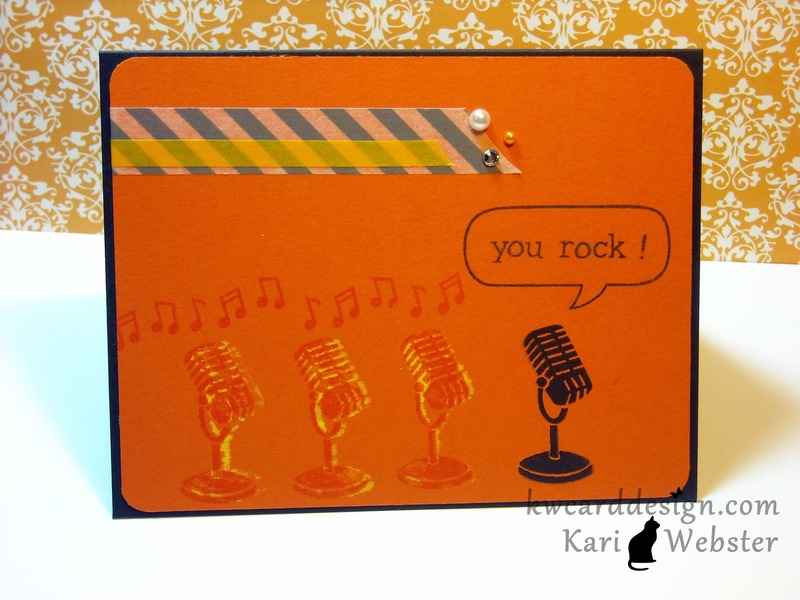 Like they say - its great for card makers - my card panel is the Circus Peanuts color, and the Licorice Twist is my card base. As always I enjoy participating in the LSC. It is my favorite Challenge blog :) I'll meet you back here soon! WOW! Your card is sooo cool! What a great effect you created! TFS! Oh, stamping with bleach! Wow, learn something every day! Never heard of this or even thought about trying it! Great card and great technique! So glad you joined us Lawnscaping gals for our technique challenge!!!! This is really cool! I've never heard of this technique, but how cool! Thanks so much for enlightening me! Your card came out so cool and retro. Thanks for playing with us at Lawnscaping! Sweet Stamp Shop Day 3 Sneak Peek! 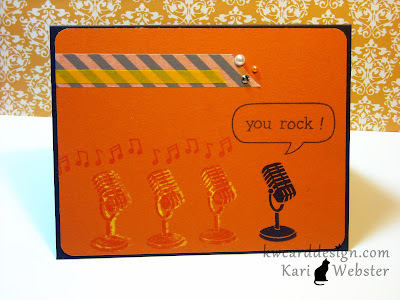 Sweet Stamp Shop OCT. Release Week! !